The first US national park created entirely by private donations of land, Acadia today is protected and enriched by the members, donors, and volunteers of Friends of Acadia. From the cobblestone beaches to the spectacular night skies, and on every inch of the historic hiking trails and carriage roads—all of Friends of Acadia’s accomplishments start with the dedication of members and donors like you. Why Join Friends of Acadia? The best benefit of Friends of Acadia membership is the satisfaction of helping to preserve Acadia for current and future generations. In addition, all members receive a subscription to the Friends of Acadia Journal, published three times annually; a “Friends of Acadia Member” decal; invitations to annual events; and a complimentary one-year subscription to Chimani Perks. 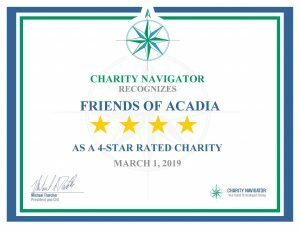 For the 8th year in a row, Friends of Acadia has been recognized by Charity Navigator with their four-star rating. Charity Navigator, the nation’s largest and most-utilized evaluator of charities, examines two broad areas of a charity’s performance—financial health and accountability & transparency. To view our Charity Navigator listing and to learn more, visit Charity Navigator.